Mesothelioma has a long latency (inactive) period of anywhere between 15 - 50 years. Once the diagnosis of malignant mesothelioma has been confirmed, the next step is determining the extent of the disease (called staging). Imaging studies, such as computed tomography (CT) and magnetic resonance imaging (MRI), allow physicians to assess the stage of the disease and determine the most appropriate treatment. The staging system used in the past for mesothelioma is the Butchart System. This system is based mainly on the extent of the primary tumor mass, and divides mesotheliomas into stages I through IV. Many doctors will still use this system. Staging defines how far the cancer has spread from its original location to other parts of the body. • Stage I - The tumor is found in the pleura with or without some involvement of the lung, pericardium (lining of the heart) or diaphragm. • Stage II - The tumor is found in a stage I location, plus there is involvement of some lymph nodes in the chest. • Stage III - The tumor has extended into the chest wall, ribs or heart, through the diaphragm or into the peritoneum (the abdominal lining). There also may be involvement of the lymph nodes. • Stage IV - The tumor has spread through the bloodstream to distant sites (that is, it has metastasized). • Recurrent mesothelioma - The tumor has recurred after treatment. Stage I also is called localized disease, whereas stages II to IV are called advanced disease. Stage I disease generally has the best prognosis, particularly when the tumor is of the epithelial type. If the diagnosis is mesothelioma, your doctor will need to know the stage of your disease. Staging can be clinical or pathological. Clinical staging relies on scanning tests and x-rays. Pathological staging refers to staging done at surgery. Malignant mesothelioma moves through four stages, each one more serious than the next. The cancer is described as localized if it is found only on the lining surface where it originated. If the cancer has spread beyond the original site to other parts of the body, such as the lymph nodes, chest wall, or abdominal organs, it is considered as advanced. The stage of the cancer will determine treatment options and helps determine the prognosis of the disease. Pleural mesothelioma is the only mesothelioma that has a staging system. But the clinical staging systems are considered inadequate due to the way the disease spreads. Stage I: Mesothelioma involves right or left pleura and may also have spread to the lung, pericardium, or diaphragm on the same side. Lymph nodes are not involved. Stage II: Mesothelioma has spread from the pleura on one side to nearby lymph nodes next to the lung on the same side. It may also have spread into the lung, pericardium, or diaphragm on the same side. Stage III: Mesothelioma is now in the chest wall, muscle, ribs, heart, esophagus, or other organs in the chest on the same side with or without spread to lymph nodes on the same side as the primary tumor. Stage IV: Mesothelioma has spread into the lymph nodes in the chest on the side opposite the primary tumor, or extends to the pleura or lung on the opposite side, or directly extends into organs in the abdominal cavity or neck. Any distant metastases is included in this stage. Mesothelioma does not usually spread to the bone, brain, or adrenal glands. Pleural mesothelioma tumors are usually found only on one side of the lungs.Family members and others living with asbestos workers have an increased risk of developing mesothelioma, and possibly other asbestos related diseases. Early Mesothelioma screening tests can diagnose mesothelioma earlier than conventional methods thus improving the survival prospects for patients. Mesothelioma death rates increased from 1980 to the late 1990s, the death rate from mesothelioma in the USA increased from 2,000 per year to 3,000, with men four times more likely to acquire it than women. Working with asbestos is the major risk factor for mesothelioma. Mesothelioma is now known to occur in those who are genetically pre-disposed to it. We have helped people with mesothelioma cancer for more than six years ! For those diagnosed with asbestos cancer / mesothelioma it is very important to consult with an experienced asbestos lawyer. In most cases there are funds available for your treatment and personal suffering. 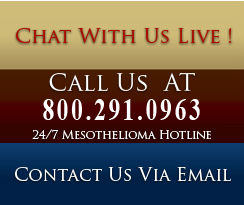 Call us Toll Free at 800.291.0963 or use our Mesothelioma Attorney Contact Form located on the right side of this page for a quick response.There is NO COST or obligation for this service.